I am still working in my journals. 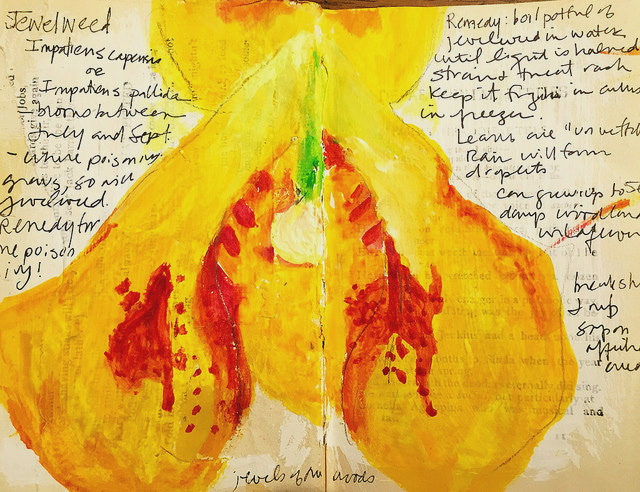 Painting my subjects mainly in gouache and then jotting down notes on interesting scientific facts as well as lore and symbolism. Jewelweed is a woodland wildflower that I find fascinating. It is said that where there is poison ivy, Jewelweed will be close by. And why would that be? Turns out the Jewelweed is an antidote to the rash that poison ivy can cause. How cool is that? It is currently in bloom in the area that I live in (Maryland). I have always loved ferns, so much so that I used it in designing my wedding invitations back in the day. I read somewhere that there are about 12,000 species of fern and that one of the earliest fossils dates back to 360 million years ago. That is before dinosaurs. It is naturally a symbol of ancient life and endurance. 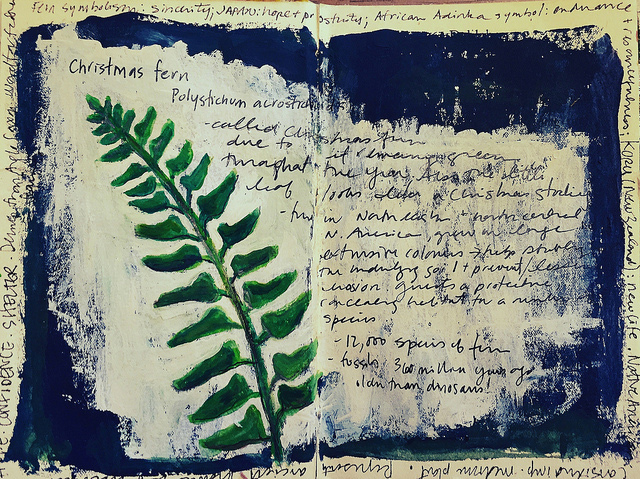 One of the reasons why I picked the Christmas Fern to paint is not that it is a particularly beautiful fern. It is kind of a hardy looking fern, not delicate like the Maidenhair Fern or the vibrant green of the Sensitive Fern. It is mainly because once you learn it, it is so easy to identify it! Each little leaflet looks like a little boot or a Christmas stocking. Cute! The blue and white paint that I used for this spread was from Seth Apter’s line of paint colors. It was nice because I didn’t have the page gessoed, but it didn’t matter! And my micron pen wrote beautifully on top of the paint, which was why I bought the paints in the first place as I am so done with my pens getting ruined from trying to write on top of paint. Seth did not ask me to write about the paint or endorse it or anything. Just wanted to share my good experience with them. A Northern Flicker visited my backyard the other week. I have never seen one before, or at least I didn’t know what I was looking at if I had. It is such a beautiful bird. 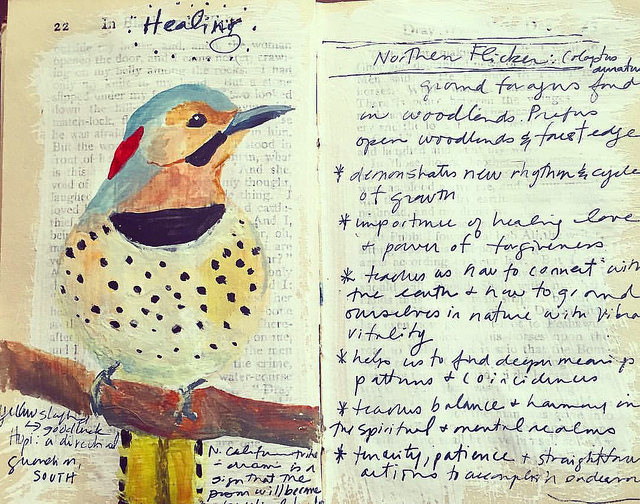 So many patterns in its feathers that it makes sense that some believe that if a flicker crosses your path it is a sign to look for patterns and coincidences in your life that you need to learn from. I have been working on an abstracted painting based on the Northern Flicker and have been stumped on where to go with it. So interesting that the Northern Flicker stopped by for a visit! My daughter was the one that saw it first. She always seems to be the one that finds the birds in our yard. She must be looking out the window much more often than I think. I love, love, love this one! 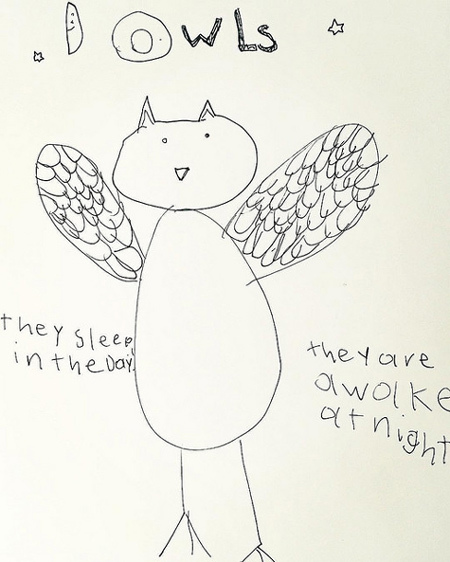 I went into my 6 year old’s room today and found her sketch book open to this page. Apparently someone has been paying attention to what I have been doing.